The 296' Mega Yacht Lauren L was built in Germany in 2002 and refitted in 2004 and 2008 with Solas classification exacting standards to the highest level of both safety and comfort. She is the perfect, private yacht for a very large family, a corporate meeting or conference venue. 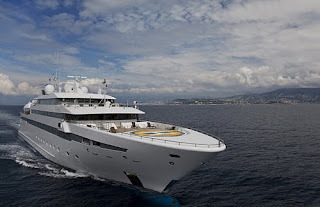 Forty guests can sleep aboard and the motivation to attend a conference on a yacht like this is simply irresistible. Lauren L makes opposites attract: enormous open entertaining areas and small, intimate areas for private discussions, sunbathing space and covered terraces, a superbly equipped business centre and a vast array of leisure equipment. Day and night, the yacht provides everything to ensure the complete success of your charter. Currently the 'Lauren L' includes a Beauty salon, a Conference center seating 17 around a Mahogany table with a 50 inch plasma flat screen multimedia TV System with multifunction panel for internet video conferences and a library with computer internet access and a comprehensive selection of books. All suites have permanent computer internet access. Separate dining areas, one seating 12 persons and the other 50 persons. Other facilities include open bar areas, sun deck with Jacuzzi, four large tenders and a helicopter landing pad. During he refit in winter 2007 she underwent further improvements, which include a Health and Beauty center, including Sauna, Steam room, Gymnasium, Aromatherapy, Relaxation Room with aquarium, and Massage Room. Also an open air restaurant with additional bar areas and an increase in the VIP suites from 14 to 20. Digital television with at least 50 satellite channels. Digital video-on-demand service with at least 600 movies. Digital music-on-demand service with at least 10,000 songs. Digital TFT TV-sets in every cabin. Personal computer in every room. Printing capabilities for A3 documents and photos. Communications Wi-Fi phone in every cabin. Wi-Fi coverage for data and telephony via 802.11a/11.b access points. Digital IP telephones with QoS, connected to the Worldwide IP telephony network. 1 Sea Doo Bombardier (200 hp) speed boat. 4 Polaris (2 x 140 hp and 2 x 135 hp) jet skis. Diving equipment. Bauer dive compressor.